Wilden, part of PSG, a Dover Company and a worldwide leader in air-operated double-diaphragm (AODD) pump technology, is pleased to announce that it will be showcasing new models of its sanitary Saniflo FDA and Hygienic Series (HS) AODD pumps at the upcoming Anuga FoodTec 2015. Anuga FoodTec – which will be held from March 24-27 in Cologne, Germany – is an international trade fair for the food and drink processing industry. Exhibiting in Hall 9.1, Stand E091, Wilden will be featuring a variety of its Saniflo HS AODD pumps, including new models powered by the just-released stainless steel version of the energy-efficient Pro-Flo SHIFT Air Distribution System (ADS). Offering the versatility, safety and capability needed in food-and-beverage processing, Wilden’s SHIFT Saniflo efficiently pumps a full range of viscosities, solids and shear-sensitive products. These new AODD pumps feature 316 stainless steel wetted parts, tri-clamps for compatibility with sanitary piping systems, significant energy savings, long life and simplified maintenance. In addition, the design of SHIFT Saniflo pumps do not contain any mechanical seals or rotating parts, which eliminates any nooks and crannies where product residue can be trapped and compromise the sanitary operation of the pump. Wilden’s patent-pending Pro-Flo SHIFT ADS incorporates a unique Air Control Spool that automatically restricts the amount of air going into the pump during the latter part of each stroke, which eliminates over-filling of the air chamber and results in reduced energy consumption. 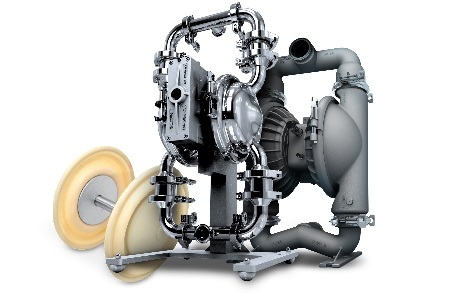 By optimizing air consumption, the Pro-Flo SHIFT lowers energy and operating costs, achieving up to 60% savings over competitive AODD pump technologies. Available in 38mm (1.5”), 51mm (2”) and 76mm (3”) inlet/outlet sizes, various models of the ProFlo SHIFT Saniflo pumps are available for compliance with industry standards, such as EHEDG, 3A, FDA CFR 21.177, USP Class VI, 1935/2004/EC, CE and ATEX requirements. Wilden AODD diaphragms are available in Buna-N, EPDM, PTFE, Saniflex and Wil-Flex. In addition, Wilden will also be featuring its innovative and patented Full-Stroke Integral-Piston Diaphragms (FSIPD) at the show. Wilden FSIPDs are well suited for hygienic applications because of high cleanability and hygienic standards. These diaphragms are constructed of food-grade Wil-Flex (Santoprene), and unlike conventional diaphragms, the integral piston is completely encapsulated within the TPE material, meaning there is no outer piston that can trap fluid and particles as well as no fabric or adhesives that could contaminate the product. This makes possible or shortens clean-in-place (CIP) processes or facilitates clean-out-of-place processes if needed. The large integral piston and a full-stroke shaft also enable it to maintain the same stroke length as conventional Wilden diaphragms. The diaphragm’s full-stroke design increases product displacement per stroke, which translates into improved suction lift, greater flow rates and higher efficiencies than experienced when using pumps that operate with reduced stroke diaphragms. For more information, visit wildenpump.com. Jim Wilden revolutionized the pumping industry when he invented the air-operated double-diaphragm (AODD) pump in 1955. Since then, Wilden AODD pumps have proven to be trustworthy solutions to pumping applications in a wide variety of industries. Wilden pumps are part of PSG, a Dover company, and manufactured in Grand Terrace, CA.